This shawl is a fanciful look at an ocean reef and the wonderful creatures that live there. In this shawl, you'll knit seashells, crabs, seahorses, starfish, two kinds of fish and foamy waves. This is a garter stitch shawl with every row knit. 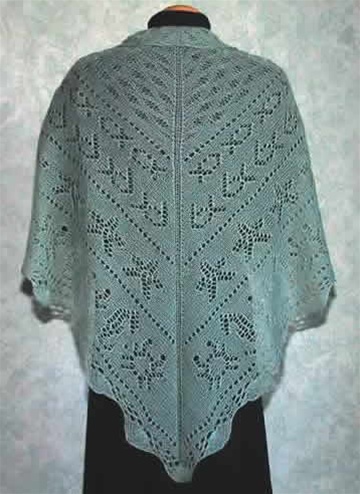 It is knit from the bottom edge to the middle of the top edge, in a triangle shape. Finished size is 86" tip to tip across the top, 45" at center back. Takes about 1260 yards of lace-weight yarn.